‘An Autonomous Chemically Fuelled Small-Molecule Motor’ Miriam R. Wilson, Jordi Solà, Armando Carlone, Stephen M. Goldup, Nathalie Lebrasseur and David A. Leigh, Nature, 534, 235-240 (2016). Full Article. UoMCamera video. Figure 1. 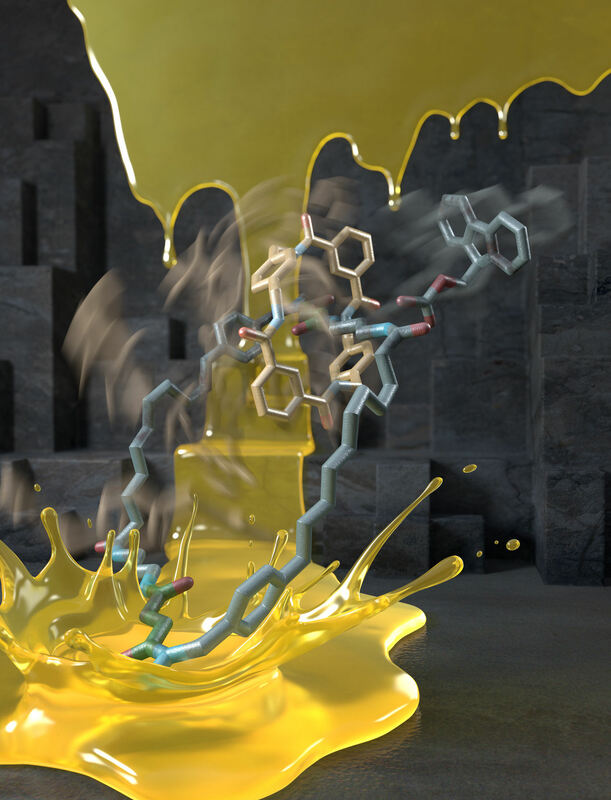 An autonomous chemically fuelled molecular motor. Addition of Fmoc-Cl causes the blue ring to continuously rotate in a clockwise direction around the cyclic track. The Fmoc-Cl is activated by the bulky pyridine catalyst and reacts with any free OH groups on the track to form the Fmoc carbonate. Contemporaneously Fmoc groups are slowly cleaved from the track by Et3N. The rate of addition of the Fmoc groups depends on the position of the ring on the track, whereas the rate of cleavage does not. This biases the direction of Brownian motion of the blue ring causing directional rotation of the motor components. Designing molecular motors is rarely an intuitive process because behaviour at the molecular level is often very different to what we observe in our ‘big’ world. In the mechanical machines we are familiar with the parts (cogs, flywheels, pistons etc) do not move unless and until a force is applied to make them do so. At the molecular scale, however, molecules and their parts are constantly moving through Brownian motion and it is finding ways to control the directionality of that motion that is the key to developing working nanomachines. Now, scientists at the University of Manchester have invented a synthetic molecular motor that runs off chemical energy in a similar manner to the way that motor proteins use ATP (adenosine triphosphate) as a fuel (Figure 1). In the man-made nanomotor, a synthetic molecular ring moves directionally around a molecular track powered by the motor's catalysis of chemical reactions of a fuel. Remarkably, the motor mechanism depends on information transfer about the position of the ring to the track: when the ring is at the top of the track consumption of the fuel causes the motor to allow the ring to move faster to the right than to the left; when the ring is at the bottom of the track the motor allows the ring to move faster to the left than to the right. The net result is that the ring moves clockwise around the track as long as there is chemical fuel left for the motor to consume, just as a train can travel along a railway track until the diesel for its engine runs out. Figure 2. The molecular motor mechanism presented in terms of the train chase in ‘Wallace and Gromit - The Wrong Trousers’, Aardman Animations 1993. Wallace and Gromit and the penguin are characters copyright of Aardman Animations Ltd, likeness used here by kind permission. Image may not be used elsewhere. We use that scene here to illustrate the nanomotor mechanism (Figure 2). 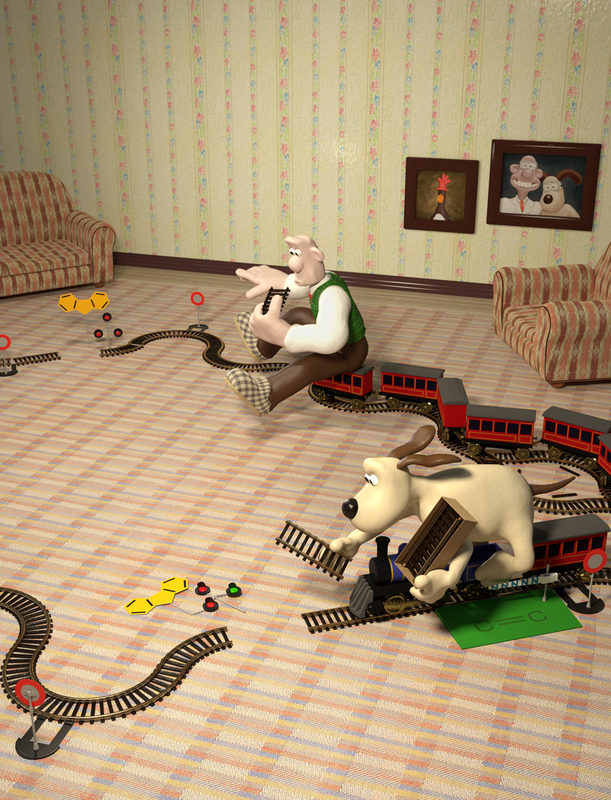 In the nanomotor, although the ‘train’ (the molecular ring) is subject to Brownian motion in both directions, when the train is at the green platform a chemical reaction involving the fuel occurs that allows the train to preferentially move forward by Brownian motion (Gromit lays down some track). However, once the train has passed this position, a different chemical reaction occurs causing the backward route to be unavailable (Wallace removes the track) meaning that the train cannot move backwards, only forwards, through Brownian motion. It is the position of the train on the track (information transfer) that determines whether at any given time track is being put down or taken up. In physical terms this is called an ‘information ratchet’. E. R. Kay and D. A. Leigh ‘Rise of the molecular machines’, Angew. Chem. Int. Ed. 54, 10080-10088 (2015). M. R. Wilson, J. Solà, A. Carlone, S. M. Goldup, N. Lebrasseur and D. A. Leigh ‘An autonomous chemically fuelled small-molecule motor’, Nature 534, 235-240 (2016). V. Serreli, C.-F. Lee, E. R. Kay and D. A. Leigh ‘A molecular information ratchet’, Nature 445, 523-527 (2007). B. Lewandowski, G. De Bo, J. W. Ward, M. Papmeyer, S. Kuschel, M. J. Aldegunde, P. M. E. Gramlich, D. Heckmann, S. M. Goldup, D. M. D’Souza, A. E. Fernandes and D. A. Leigh ‘Sequence-specific peptide synthesis by an artificial small-molecule machine’, Science 339, 189-193 (2013). 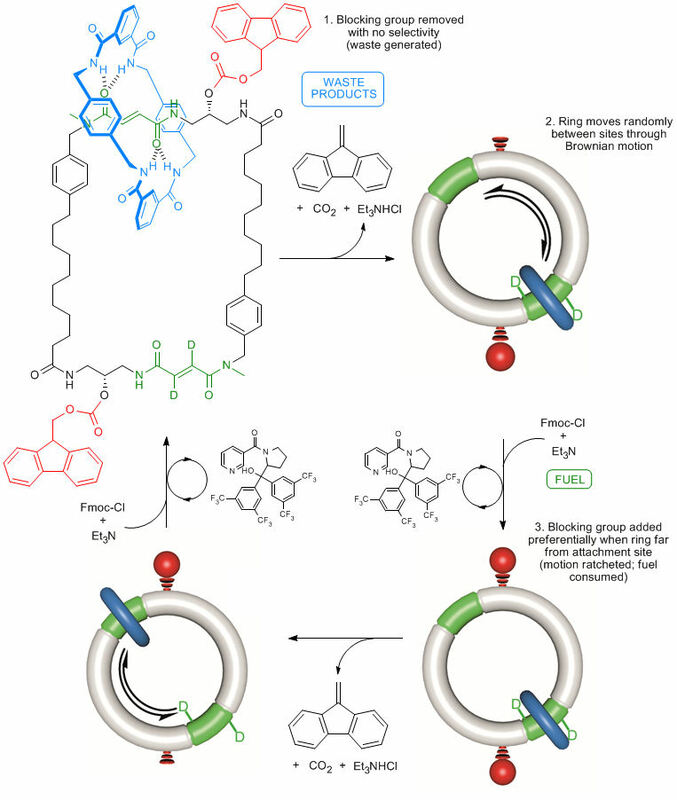 S. Kassem, A. T. L. Lee, D. A. Leigh, A. Markevicius and J. Solà ‘Pick-up, transport and release of a molecular cargo using a small-molecule robotic arm’, Nature Chem. 8, 138-143 (2016).